This review is part of the Carole Lombard Blogathon being hosted by Carole and Co. The name Alfred Hitchcock on the movie screen evokes the notion of suspense or a thriller, even horror; some sort of on the edge of your seat nail biter for sure. 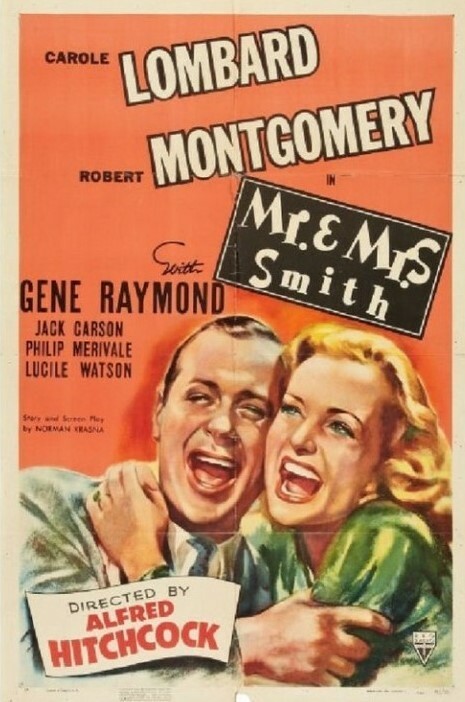 Certainly, the name Alfred Hitchcock does not bring to mind the words ‘screwball comedy.’ Therefore, in 1941 when RKO released “Mr. and Mrs. Smith” and the credits rolled on to the screen with the words “Directed by Alfred Hitchcock,” many theatergoers may have been surprised by what they were about to see or even confused, then again, they may have been thrilled once they realized they were about to watch a delightful, charming, if not totally successful, battle of the sexes played by two of the finest and most attractive performers for this kind of film.